India on Jan. 2 successfully test fired the nuclear-capable Agni-IV ballistic missile off the Odisha coast. 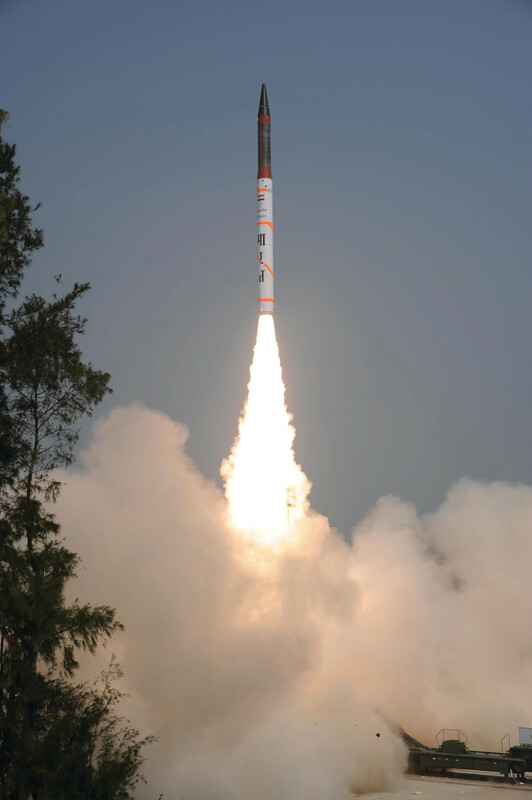 The test comes within a week of the successful test of Agni-V intercontinental ballistic missile. The Jan. 2 launch came at about 11.50 a.m., from a mobile launcher off the Balasore coast in the Abdul Kalam Island, defense sources said. The launch operations were carried out by the Strategic Forces Command, part of India’s Nuclear Command Authority (NCA). It is responsible for the management and administration of the country’s tactical and strategic nuclear weapons stockpile. This is sixth test of the missile and second user associate launch. The missile was earlier test fired in 2011, 2012 and twice in 2014. The last test took place in November 2015. All tests have been successful, said the Defense Research and Development Organization (DRDO), which has designed and developed the missile. The two-stage solid-propelled, surface-to-surface ballistic missile was designed to carry a 1-ton payload to a distance of 4,000 km. The missile’s length is 20 meters and weighs 17 tons. It is equipped with state-of-the-art technologies, which include indigenously developed ring laser gyro and composite rocket motor. Agni-IV is equipped with state-of-the-art avionics, 5th generation On Board Computer and distributed architecture. It has the latest features to correct and guide itself for inflight disturbances. The most accurate Ring Laser Gyro based Inertial Navigation System (RINS) and supported by redundant, highly reliable Micro Navigation System (MINGS), ensures high accuracy. Its re-entry heat shield is capable of withstanding high temperatures that may reach as high as 4,000 degree Celsius and above during re-entry of missile in earth’s atmosphere and makes sure that the avionics function normally, with inside temperature remaining less than 50 degree Celsius.